I'm an artist living in Los Angeles, and have been focusing on the urban landscape and its impact on the human condition. I paint situations that tell a story and reveal deeper issues that are occurring. 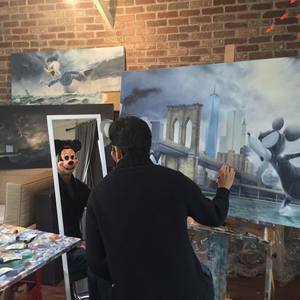 Born and raised in East Village, New York, I began at an early age, painting everything I observed in the city. As a completely self taught painter, I studied a wide range of artists, finding inspiration from classical renaissance masters to comic illustrators. My recent body of work began when I moved to Los Angeles in 2007 as I fell into in a love-hate relationship with the city. I couldn't ignore the city’s stark contrasts and constant tension between the rich and poor, real and fake, corruption and innocence, crowdedness and loneliness. Based on these themes, I rely on the city's mystique and beauty as the backdrop to frame the story. I reimagine familiar images of everyday life in an unnatural way to play with people’s expectations. Fortunately, my new life in Los Angeles has allowed me to devote more time to painting and tell the stories I want to tell.